It’s been quite a year for the UK. It lost one of its biggest music stars, voted to leave Europe and its top-ranked national football team were beaten by Iceland. 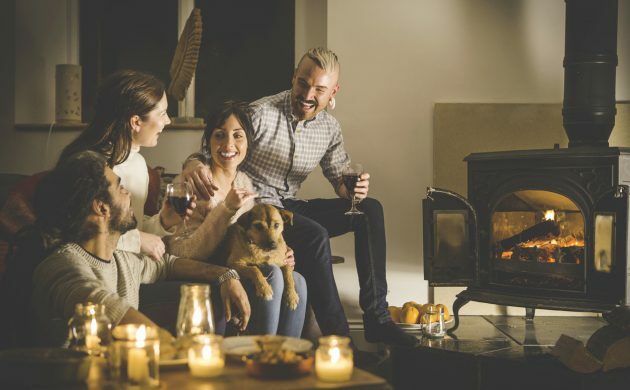 There’s a strong argument that they need all the hygge they can get – which might explain why no less than nine books featuring the Danish concept in their title have been published this year. It seems as though – for a fleeting moment – hygge is the ‘new black’, or at least the new Nordic noir. Since Sarah Lund and her iconic sweater walked onto the scene, the British middle classes have become obsessed with Scandinavia, willing to shell out stupid money for books on glögg, knitted socks and blazing fires. And it’s been going on for five years! Adrian Lloyd Hughes, a DR journalist and TV presenter, whose name betrays his Welsh heritage on his father’s side, has ‘a foot in both camps’. He admits the proliferation of the hygge books has taken him somewhat by surprise. He contends that the enthusiasm for “all things Danish” is a direct spin-off from the TV series ‘Borgen’, which made Denmark a “high-flying brand”. He felt there is a certain fascination amongst UK TV viewers to see how a different electoral system works and, above all, that you can have a female PM who actually has children and a home-life and is not wedded to work! So perhaps the Brits harbour a sneaking admiration for this very small country with a total population less that of Greater London and almost no natural resources, which still manages to do very well in the economic league tables. Hughes commented that the only thing the Danes have really got going for them is their intellect, which they use to claw out a position in the world. Hughes also touched on the characteristic bluntness of the Danes, which is often (mis)construed as rudeness by foreigners unaccustomed to such plain speaking. He admitted that here there is perhaps more of a communications gap between Danes and Brits than Danes realise. This mutual fascination with each other’s cultures has quite a backstory. There is a long tradition of interaction – both peaceful and otherwise – between the two cultures. The earliest writings on this are probably those found in the Anglo Saxon Chronicle, in which what is believed to be the first Viking raid, on the monastery of Lindisfarne on an island of the same name off the northeastern English coast in 793, is described. The anonymous author certainly pulled no punches: “On 6th ides of January, the ravaging of wretched heathen people destroyed God’s church at Lindisfarne.” Not much evidence of hygge here, then! However, relations between the two countries obviously became more cordial because during the reign of Christian IV (1577-1648), the lutenist John Dowland spent a great deal of time at the Danish court and composed one of his most famous pieces there, ‘King of Denmark’s Galliard’, which was written especially for Christian. A little later, the diplomat and writer Viscount Robert Molesworth visited Denmark and wrote a book entitled ‘An account of Denmark: as it was in the year 1692’. Molesworth’s book, however, set back Anglo-Danish relations somewhat, as it was not at all well received in Denmark. From 1689-92 Molesworth was envoy to the Danish Court, but due to political and religious differences, he had trouble getting along with the Danish nobility and courtiers. His book was a scathing attack on the Danish absolute monarchy system, and it also contained side-swipes at the army, church and what he saw as the miserable conditions under which ordinary people lived. “I never knew any country where the minds of the people were more of one calibre or pitch than here; you shall meet with none of extraordinary parts or qualifications, or excellent in particular studies and trades; you see no enthusiasts, mad-men, natural fools, or fanciful folks,” he observed. In fact, this could be read as a fairly spot-on description of Denmark in the present day – at least, the bit about equality and the homogeneity of society seems to fit pretty well. But Molesworth’s book was a political treatise against the dangers of absolutism, advocating a republican agenda, so needless to say, his criticisms were not popular. Another British commentator on Denmark was also a diplomat. Sir James Mellon was British ambassador to Copenhagen from 1983-86. Regarding the enigma of the Danish people and Danishness, Mellon theorised that the Danes are not really a nation in the normal sense of the word, but a tribe (or group of tribes) whose behaviour strongly reminded him of the behaviour he saw amongst the Ashanti people in Ghana during his posting to west Africa (1978-3). “When talking about the idea of a ‘nation’, this also involves the idea of fellowship, but a nation requires if not more, then at least something different. The Danes have certainly developed and adapted. They have travelled around the world and forged commercial and cultural links in all corners of it. But they have never found their way to a synthesis of dissimilar elements, which is what is required for a proper nation. Their unity as a people is in fact due to the emphasis on uniformity. So this is not ‘both and’, but ‘either or’.” Whether this counts as damning with faint praise is for the reader to judge. Mellon also commented on the fact that Denmark is not as homogeneous as it might seem. He related a story set in Aabenraa, near the German border, in which a woman was despairing how an acquaintance was going to marry a German. “Still, said somebody, it could have been worse, it could have been somebody from Copenhagen. She was not joking. They all agreed with her. These are all Danes, outside – there’s no question about it, every Dane is closer to every Dane than to anybody else, but inside – it is not just one tribe,” said Mellon. So Anglo-Danish relations have certainly had their ups and downs over the years. Perhaps it takes an outsider, coming in with a detached viewpoint, to highlight the cultural quirks, strengths – and also weaknesses – of a society or people. Coffee-table books on hygge probably won’t really cut the mustard in that respect, and many of them will be clogging the remainder bins by this time next year. Now what’s really needed is a Danish Molesworth or Mellon to take a penetrating look at the UK. Give yourself a chance: Who pays the bill when large banks fail?